The people of the Sierra Nevada are as diverse and magnificent as the mountains they call home, and their independent and fun loving spirit is reflected in the bountiful music and arts scene that the High Sierras are known for. If you’re looking for local flavor, inspiration, and a good time, here is a list of popular annual music and art festivals that you don’t want to miss…. Sierra Nevada World Music Festival – Held annually at the Mendocino County Fairgrounds in Booneville, the SNWMF is one of the premier world music festivals in the world. Enjoy dozens of bands, including the likes of Chronixx, Macka B, the Talking Dreads, and others over the course of this 3 day festival of peace and love held on the Summer Solstice. High Sierra Music Festival – Fans come to the town of Quincy from all across the country every July to hear the best rock, jam, bluegrass, and funk bands in the world. If names like the Trey Anastasio Band, J.J. Grey and Mofro, Leftover Salmon, Umphrey’s McGee, the Del McCoury Band, and Widespread Panic get your attention, then this festival is one that you definitely want to get on your calendar. Snow Goose Festival – Enjoy this annual celebration of one of the greatest mass bird migrations on the planet (and other avian frequenters of the Pacific Flyway) every January in Chico, CA. With banquets, speakers, educational opportunities, avian inspired art, and more, this four day festival draws birdwatchers from all across the world to witness the mass migration of Snow Geese to their traditional wintering areas up and down the Sierra Nevada. Bear Valley Music Festival – If musical diversity is your thing, the Bear Valley Music Festival is your thing. Located in Bear Valley, halfway between Tahoe and Yosemite, the Bear Valley Music Festival hosts acts as diverse as the pianist Vladislav Kern, the Bear Valley Orchestra, the Mama’s and the Papas, Hal Ketchum, and the Big Bad VooDoo Daddies. From wine tastings to rock concerts, this festival has it all. Sierra Nevada Arts and Crafts Festival – An annual four day celebration of arts and crafts at Bristols Café grounds in Arnold, the Sierra Nevada Arts and Crafts festival has been showcasing Sierra inspired artists for 45 years and running! Eastern Sierra ATV and UTV Jamboree – If Yamahas make you think of off-roading rather than guitars, then the Eastern Sierra ATV and UTV Jamboree in Coleville/Walker should be on your bucketlist. Held for four days every September, the Jamboree features good times and group rides for off-road enthusiasts all across the country. The Sierras are one of the most majestic and diverse mountain ranges on earth. How diverse are they? On a single road trip you can see live volcanoes, glacial valleys, great sequoias, and scorching deserts. Here’s a list of some of the must see destinations if you’re a nature lover in the High Sierras . . .
Yosemite National Park – Home to Half Dome and El Capitan, Yosemite National Park is one of the original crown jewels of the United States of America’s National Park system. Its scenic alpine vistas, pristine lakes, cool mountain rivers, and majestic granite walls make it a mecca for adrenaline junky rock climbers and casual naturalists alike. Sequoia National Park and Kings Canyon National Park – These two national parks in the Southern tip of the Sierras are home to some of the last remaining old growth sequoia forests in North America. Be sure you stop to see General Sherman, the largest tree on the planet, and hike the Congress Trail in Kings Canyon National Park. Being in the presence of some of the largest and oldest trees on earth is often described as a life changing experience for those who visit. Mount Whitney – Sitting at the southern edge of Sequoia National Park, Mount Whitney is the tallest mountain in the lower 48, rising to 14,494 feet above sea level. If you climb it in the spring or early summer, make sure you have crampons and an ice axe at the ready. July through October, however, it’s a non-technical (though still challenging) climb to the summit. Death Valley National Park – Tucked away on the South East edge of the Sierras you’ll find Death Valley National Park. Not for the weak of heart, Death Valley is the hottest place in North America (temperatures regularly rise to 110-120 degrees in the summer), has the lowest elevation in North America (it’s actually below sea level), and is the driest place in the lower 48. Lassen Volcanic National Park – Found in the Northern Sierra, Lassen Volcanic National Park is a well kept secret, and sports active volcanoes and hydrothermal vents, as well as hundreds of hiking trails, beautiful alpine lakes, and breathtaking mountain valleys. In addition to walking the fumaroles, Lassen is popular with backpackers, stargazers, and cross-country skiers and snowshoe enthusiasts in the winter! If you’re trying to explore the Sierras on a budget or if you’re a camping enthusiast, you’re in luck. 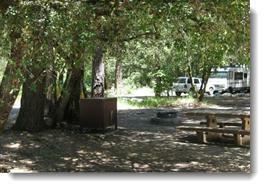 Much of the year, this is a great part of country for camping. During the warmer months, you can head up into the mountains and still find moderate temperatures. During the cooler months, you can stick to lower elevations. Either way, much of the Sierras is bear country, so be prepared to hang your food, or there are also plenty of campgrounds that provide bear boxes. The Sierras have a rich history, encompassing everything from the California Gold Rush to the infamous Donner Party to the birth of American conservationism. If history is your thing, you won’t find many places in the U.S. with a richer heritage or more colorful history. Here are a few stops that every history buff should have on their itinerary . . .
Marshall Gold Discovery State Park – When James Marshall discovered gold in the Sierra’s in 1848 it changed the fate of the state of California, and of the entire nation, forever. Marshall Gold Discovery State Park celebrates the California Goldrush, the 49ers, and gives visitors a glimpse into what life was like during one of the largest gold rushes in American history. Pan for gold, raft the American River, and see Sutter’s Mill (or what’s left of it) during your visit! Donner Memoria State Park and Emigrant Trail Museum – The High Sierras were the last true obstacle for emigrants crossing the continent from East to West during Western expansion, and the story of the Donner Party is a black chapter in that larger story. There’s more to this State Park than tragic tales of wagon trains, winter storms, and cannibalism, however. Soak up the history of the Native Americans who once called this region home, the story of the trans-continental railroad, and enjoy camping, hiking, and other outdoor activities in a beautiful mountain setting. California State Railroad Museum – If you’re a train buff, head a little bit west of the Sierra foothills to Sacramento and visit the California State Railroad Museum. Voted one of the top railroad museums in the nation, the CSRM has permanent and rotating exhibits detailing the rich history of the railroad. Be sure to finish your visit with a ride on the Sacramento Southern, a working rail line that is a museum highlight for adults and kids alike. Columbia State Historic Park – Step back in time and experience a day in the life of a 49er! Columbia State Historic Park boasts period costumed tour guides, stagecoach rides, a blacksmith’s forge, a Wells Fargo express office, and shops and stores where you can trade your wares and wrangle for some authentic Gold-Rush souvenirs. And don’t forget to hit the Western Saloon for some ice cold sasparilla before you mount your horse and head out on the trail. Lake Tahoe and the Truckee River – The Sierras have an amazing natural history as well. Water spends on average 700 years in Lake Tahoe before finding its outlet into the Truckee River. (The lake itself is about 2 million years old.) 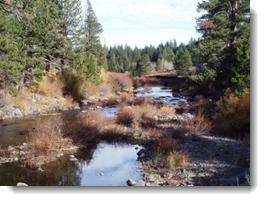 So, when you see or wade into the Truckee River, know that that water is three-quarters-of-a-millenium old…. Backpacking – The Sierra Nevada are a backpacker’s paradise. Whether you’re tackling the 42 mile Rae Lakes loop in Kings Canyon National Park, the 27 mile trek from Glacier Pass to Sawtooth Pass in Great Sequoia National Park, or you’re just hiking a few miles in on any one of the thousands of trails that cross the 400 miles of terrain that make up this majestic mountain range, packing it up and hiking into the backcountry is one of the most popular past times in the High Sierras. Skiing – Anybody whose anybody knows that some of the best snow in the world can be found in the Sierras. Whether you ski Lake Tahoe, Bear Valley, Mammoth, or Squaw Valley, the Sierras are a winter wonderland for skiers and snowboarders alike. Horsepacking Trips – With its western heritage, the Sierra Nevada are still home to plenty of equine enthusiasts who like to saddle up and head into the wilderness for a little R & R. Most backcountry trails permit horse travel, though if you’re in doubt be sure to check with the locals about permits and restrictions. Rock Climbing – Anyone who has ever strapped on a harness, roped up, and clipped into a carabiner knows that there aren’t many places in the rock climbing world more legendary than El Capitan and Half Dome in Yosemite. Climbers flock to the vertical granite face annually to try to their hand at some of the most difficult and technical climbs on the planet. But that doesn’t mean the fun stops there. The solid granite and steep faces of the Sierras make the entire range a rock climber’s dream. 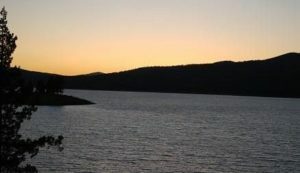 Water Sports – Whether you’re canoeing on Lower Bear Reservoir, white water rafting down the Merced, or waterskiing on Lake Tahoe, the Sierras are a great place to get wet and cool off in the summer. Fishing is a popular pastime throughout the High Sierras, and the growing popularity of kayaks and stand up paddleboards have made lakes, reservoirs, and rivers increasingly popular weekend destinations for those looking to the Sierras for an escape from the daily grind. …from the shores of Lake Tahoe at twilight. We were too busy having fun on the lake to get a picture during the day!! Few places in the world have a richer mix of natural beauty, history, and arts and culture than the Sierras. Stretching nearly 400 miles from Bakersfield on up to California’s northernmost borders, the Sierras boast natural wonders like Yosemite and Sequoia National Parks, music and art festivals like the High Sierra Music Festival and the Sierra Nevada Arts and Crafts Festival, and tourist draws as diverse as wine tastings in the Shenandoah Valley and skiing the High Sierras. And if that’s not enough to grab your attention, there’s always Lake Tahoe, Death Valley, Kings Canyon National Park, Mono Lake, and hitting the casinos in Reno. The Sierras truly have a little something for everybody. Whether you’re looking to make the Sierras home, are just passing through, or are planning your next vacation, here’s a comprehensive guide to the Sierra Nevada, and a celebration of the rich Sierra heritage. To be able to live and work in this area is a blessing. It is not easy, with just incredible and storied amounts of snow, the view of the deep blue of Lake Tahoe that never gets old. Far enough away from big cities that we still feel small, but close enough to be accessible by many. If you look on the map, nearly anywhere in the world, you won’t find a place nor a culture quite like this that is snuggled amidst some of the most sought after places to be in the entire world.